So, my cooking school was my family. As a teenager I went daily with my mother to Perugia’s central market to help her shopping before work. This way we had our fresh supply of bread, eggs, meat and vegetables. We bought our first freezer sometimes in the late ’70s. Pre-cooked food or frozen food was not available. We were especially particular about the quality of the meat. To this day, I can hardly bring myself to buy meat from the supermarket because I do not know the butcher. I will chose a butcher based on the quality of the sausages. If you put them in the pan and they do not shrink to half their size loosing a lot of water and fat then I will go back to that shop. The next parameter is the prosciutto. It has to be local and aged at least 18 months but still not too salty. The fat should be soft and melt in the mouth. Stringy fat indicates low quality prosciutto. 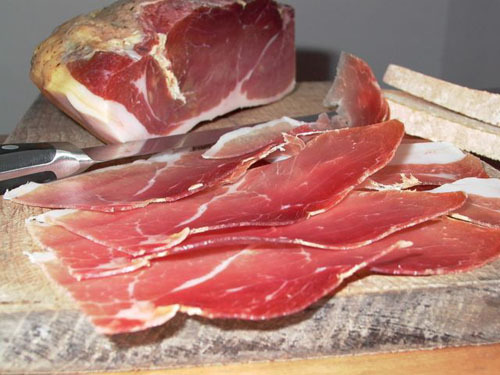 A shop selling a good prosciutto will generally provide high quality foods. That looks mouthwatering! Thanks for the tips! Ciao Sandra, thank you for commenting. The bad news is that I will now be pestering everybody with my tips!